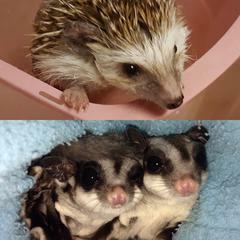 Our focus is taking in animals who are at risk of euthanasia/death due to being in an animal shelter, or in a location where sugar gliders and hedgehogs are illegal to own. We are unable to take in private surrenders for the forseeable future. We are a small, private, donation driven 501 (c)(3) rescue run by volunteers who house the rescue in our private home. PLEASE NOTE: If you adopted your hedgehog, or sugar gliders from Arizona Sugar Glider Rescue & Hedgehog Mafia, and you need to return them, please contact us! We are committed to each and every animal we adopted out and are often able to take them back quickly, if needed.